Christmas Countdown 2016 #4- Online Gift Guide for the Music Lover! Have a friend who is always listening to music or singing? 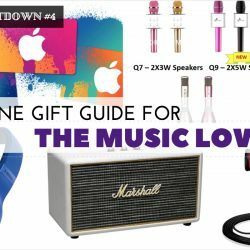 Check out our Top 10 Gifts for the Music Lover! Christmas Countdown 2016 #2- Online Gift Guide for the Fashion Lover! Christmas Countdown 2016 #3- Online Gift Guide for the Sports Lover!